You could potentially be saving thousands of dollars on your Tax Return! How? Simply by using the below Tax Depreciation Calculator to estimate the depreciation available to you on your Investment Property. Our Tax Depreciation Specialists at BMT Quantity Surveyors can arrange a depreciation review for you today! BMT will review your current situation or even assess a current report you may have. The team at BMT are also happy to touch base with your Accountant before beginning the process. 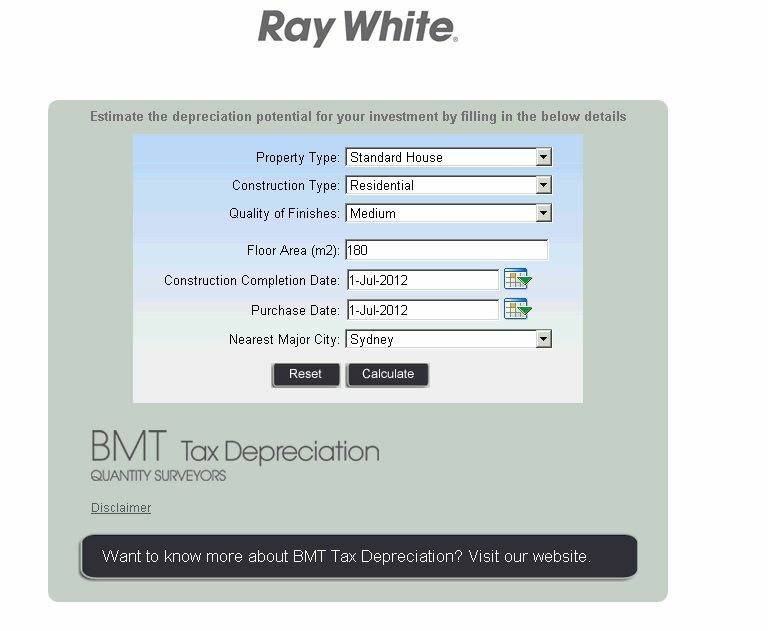 BMT offer Ray White Buderim Clients a significant discount on their advertised charge, with this process being 100% tax deductible for you. Thousands of dollars in tax deductions are lost every year by Investors who don’t know about Tax Depreciation. Old or new Investment Properties can offer a wealth of depreciation opportunities resulting in a better return for our Clients. We usually save our Investors their yearly management fees and more! When it comes to preparing a Tax Return, Property Investors are often unaware of what they can claim when it comes to Property depreciation. Depreciation is the key to increasing cash flow on a residential Property. An Investment Property does not have to be new. Both new and old Properties will attract some depreciation deductions. One common myth is older Properties will attract no claim. It is worth making an enquiry about any Property. From the date construction was completed, the Australian Taxation Office (ATO) has determined that any building eligible to claim the Building Write-Off Allowance has a maximum effective life of 40 years. Therefore, Investors can generally claim up to 40 years depreciation on a brand new building, whereas the balance of the 40 year period from the construction completion date is claimable on an older Property. Anything in the Property that occurred in a previous renovation will be estimated by our Quantity Surveyors and deductions calculated accordingly. This includes items that are not obvious, for example new plumbing, water proofing, electrical wiring or a pergola, etc. For capital improvements to be eligible for the Division 43 Building Write-Off Allowance, construction must have commenced within the qualifying dates. Plant and equipment items are items which can be ‘easily’ removed from the Property as opposed to items that are permanently fixed to the structure of the building. Items which are mechanically or electronically operated are considered plant items, even though they can be fixed to the structure of the building. Plant and equipment items include but are not limited to: hot water systems, rangehoods, carpets, garage door motors, blinds, door closers, ovens, freestanding furniture, cooktops and air-conditioning systems. The Building Write-Off Allowance (also known as Division 43) is based on the historical costs of the building and includes materials such as bricks, mortar, walls, flooring and wiring. Quantity Surveyors are qualified under the tax legislation TR97/25 to estimate construction costs for depreciation purposes and are one of a few select professionals who specialise in providing depreciation reports. They are affiliated with industry regulating bodies and gain access to the latest information and resources through their accreditations. BMT Tax Depreciation is accredited with the Australian Institute of Quantity Surveyors (AIQS), The Royal Institute of Chartered Surveyors (RICS) and The Auctioneers & Valuers Association of Australia(AVAA).